Maybe that’s because no one could figure out what fly fishing has to do with history. It doesn’t, necessarily. But it does have a lot to do, as you’ll find out in this interview, with how humans perceive and love places. “Place” is a special word for us here at Historically Thinking. While some get suspicious when humanists talk about the love of place, and sneer that they’re just step away from blood and earth, lebensraum, and the sound of jackboots on the march, we think that people can sincerely and gently love places. We think they call some of these places “home”. And if people are what they love, then we’d better figure out what kind of places they love, and why. Matthew T. Dickerson of Middlebury College and David L. O’Hara of Augustana College (South Dakota) talk with Historically Thinking host Al Zambone about their book, Downstream: Reflections on Brook Trout, Fly Fishing, and the Waters of Applachia. A mix of memoir, narrative, reporting, and meditation, Downstream explores the relationship between humans and the rivers around them. 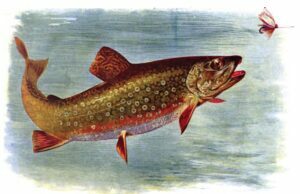 The conversation moves from brook trout and the elemental facts of fly-fishing, to rivers that the authors fish and love. It’s also about place. And, if historical thinking is in part the ability “to untangle complex problems that resist easy analysis”, then Dickerson and O’Hara are doing some historical thinking. Enjoy it…again. Or for the first time. Take Me Fishing: What is Fly Fishing?